Long Term Parking at Orom Airport Parking - JFK International Airport. 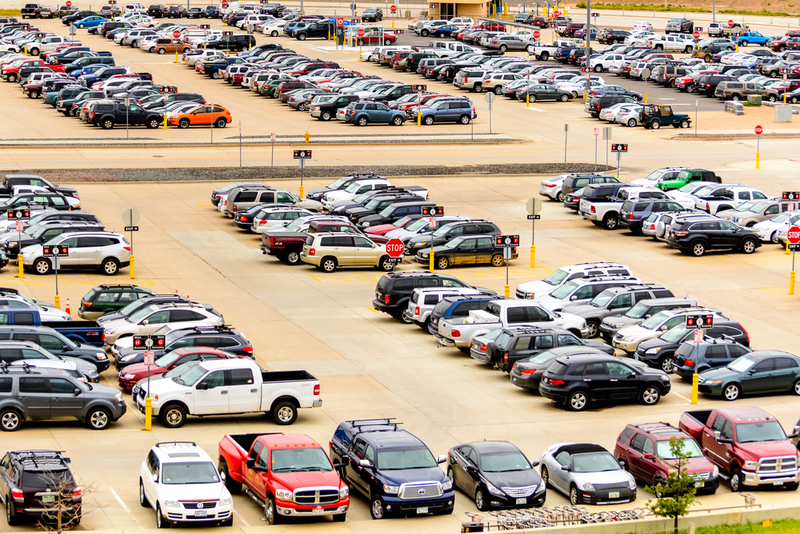 Orom Rent-A-Car now offers Long Term Parking for travellers flying out of JFK International. From regular JFK parking is a VIP experience , with FREE shuttle service to and from JFK every 10-20 minutes Orom service, includes complementary Shuttle, Luggage assistance, and other optional services. From makes parking at John F. Kennedy Airport easy! reserve your parking spot now! Upon arrival please show the lot attendant your InstaPark reservation receipt. Or call: 1-855-605-6000 for a shuttle pickup. Merge onto I-678 S/VAN WYCK EXPY via EXIT 13S toward KENNEDY AIRPORT. Take EXIT 2 toward ROCKAWAY BLVD. Turn LEFT onto ROCKAWAY BLVD. Turn Left onto North Conduit Ave. And our lot will be to your RIGHT. Take EXIT 20 toward 150 ST/ROCKAWAY BLVD. Stay STRAIGHT to go onto S CONDUIT AVE/NY-27 E/S CONDUIT BLVD. Continue to follow S CONDUIT AVE/NY-27 East. Turn LEFT to North Conduit Ave.
Take the LIE East to the Grand Central Parkway East to the Van Wyck Expressway. South. FOLLOW VAN WYCK EXPY DIRECTIONS. Triborough Bridge: Take the Grand Central Parkway East to the Van Wyck Expressway South. FOLLOW VAN WYCK EXPY DIRECTIONS. Williamsburg, Manhattan, or Brooklyn Bridges: Go South on the Brooklyn Queens Expressway (BQE) to the Belt Parkway East. Go West on the Southern State. The highway's name changes to the Belt Parkway. FOLLOW BELT PKWY WEST DIRECTIONS. Go South to the Southern State Parkway/Belt Parkway West. I-78: Go East on I-78 to the New Jersey Turnpike South to Exit 13. Cross the Goethals Bridge to Staten Island, and follow Staten Island Expressway (I-278) to the Verrazano Bridge. Go East on I-80 to I-280 East to the NJ Turnpike South to Exit 13 for the Goethals Bridge. Take the bridge East to Staten Island, and follow Staten Island Expressway (I-278) to the Verrazano Bridge. Exit the bridge to take the Belt Parkway East. Came here on a Monday morning. I expected it to be very slow but that wasn't the case at all. I showed them my ticket and it took less than 10 minutes to park my car. Again since it was the weekday I expected the shuttle to be much slower but it took 10 minutes too. I would definitely use them again! Even with tax, it's still one of the best parking prices in the area. I like having the options and I think that all their services especially the security are top notch. Very impressed with the service. Lot was clean and they were very fast. The paper I was scanning wasn't working and I called them and they told me to try it one more time and it worked ! Not sure what type of magic or remote access they had but they picked up right away. Parking was very easy. The spots are big enough for cars to be put together with space between so you don't have to worry about your door hitting someone else. That's happened to me before. But I never had any problems with Orom-JFK Airport Parking. You can tell that they really care about their customers. Booked it because it was the best price I could find. Waited for the shuttle after parking my car. No problems there. When we got back we forgot to call and ask for a pick up and waited a bit longer since the shuttle had just left. I was on hold by the office when I asked how long a wait it would be. I had a question and was worried that there would be no one around since it was very early in the morning and I had a flight at 7 am but there was someone there to help me out which I really appreciated. Was very impressed and happy with my experience. I left for over a week and my car had no scratches and was pretty much the same as when I left. I'm going to use this one again. Perfect price and best option if you are on a budget and need good airport parking. I am a student and we used this place when we went on Spring Break. I was still broke when I came back but a lot less broke than I could've been ;P The price is very cheap. Cashless is the way of the future so I didn't expect anything else. I did think that it was easy to book online and I appreciated that there were people around if you need help with getting in with your code. I think it was pretty good. Always worry about seeing cheap parking online. To me it always seems too good to be true y'know? I just couldn't believe how good Orom for JFK Airport Parking was. I always think that parking lots are going to be really unsafe but there was lots of security around. Didn't worry about anything. Everything was taken care of before so I just had to show up basically. Then I just had to show up for the shuttle and they took me to my terminal. Literally the easiest travel expereince that I've ever had! Some parking places are pretty far away from anything so I liked how close this was so it didn't take long to get to and from the airport. Good price. Liked how big it was. It wasn't too big that you would be worried about anything going wrong but it's nice not to have to wait too long. I found the site very user-friendly and I didn't have any problems booking. I wanted to make suere that they were a secure lot so when I went I talked to the office and reassured that my car would be safe. Great option for long term parking especially since it's very close to JFK. I don't want to spend another half an hour on the road to get to the airport but I didn't have to worry with this one. I am giving this the highest score I can because of the service. Not only were the attendants very helpful and friendly. Our car battery was going in and out as were leaving and they let us keep the car in the lot until we could get a tow truck even though we had already paid and left the property. They helped us push it back inside. I've never been treated that nice before from a parking lot. The price doesn't change no matter the day. Some places charge more on holidays but this one stays the same. It's the best price for long airport parking. No more fumbling for change or needing to use sketchy ATMS. Everyhing is paid for in advance so you just have to show up and show them that you paid. You get a much better deal since it's cashless. You really can't beat the price. I mean most parking is at least $25 a day including the shuttle. This one has everything included. I struggle with finding parking close to the airport for a good price. This is one of the best places that I've found. It also fits my truck with no problem. I didn't worry about dings or someone scratching my truck either. Been to other places where you had to pay extra for the shuttle or had to get a cab to go between the lot and the airport but this wasn't the case with this one. The shuttle is right there and you don't pay anything to get access to it either. So impressed. You show the attendant your ticket and then they let you in. They are there 24 hours too. I had a very late flight but even though there was no one around I still got in to get my car with no problems since I had the code that opened the gate. Price is what made me choose this one but I also liked how close it was. Shuttle wasn't very big and depending on the time and day it gets filled pretty quick. I'm used to the type of parking where you just pick a spot and then grab a ticket and pay when you leave. This one you have to book online and you don't have to hope that there's a spot available since you've already booked it. Getting in and out is a lot easier this way. For the price, you get a lot. You get a pre-booked spot, helpful staff and a shuttle to and from the airport. They have lots of optional services too that you pay a little extra for but you don't need to use them if you don't want to. Finding parking near the airport for under $20 is pretty much a hit and miss kinda situation. The really cheap places tend to be pretty sketchy and not a place that you want to leave your car long-term but this place was nothing like that. It was really big and maintained and I liked the service that I got. Extra service fees brought the price up. The shuttle was good though and the people in the office were very helpful too. Service was very great. Easy to use and no waiting for a spot or for the shuttle longer than you have to. Reserving your spot online is very easy and very fast. Honestly it took no time at all for us to book it. Scanning my code is better than just grabbing a ticket. Service was very helpful and well done. Very impressive! Everyone was very nice and courteous to us as we were coming in and leaving. The driver helped us with our luggage and the shuttle was very clean. I don't usually like using public transport but I didn't mind this one since it was well taken care of. I can see why this place has so many 5 stars. I also enjoyed using it. It was very easy and I didn't have to worry about anything. Everything was all taken care of for me even the shuttle was free. Wouldn't let me in to park because I forgot my print out. I told them to just check the computer but they said that they needed the receipt or I couldn't get in. Didnâ€™t understand why they couldn't just let me in and let me squeeze my car in. I had to use my internet to get the email and show it to them. Because of the delay I missed the shuttle and had to wait 10 minutes for the next one. Liked how close restaurants were to this place. We were able to park when were done eating and it took no time all. Since everything is so close to travel to and from there was hardly any waiting. Hard to find parking in the city and near the airport. I go through this every time that I go on a trip but now I'm only going to use this one because it had the best price. Biggest pet peeve when I am parking is having to look for change to put in the machine. You don't have to do it with this one. You pay for everything online but I brought a credit card just in case. You can also compare prices and times easier when you can see them laid out online. It's very easy to get there and use the services. They provide a lot of extra things for the price including the shuttle. The shuttle actually waits for you when you leave to but you can also call them which is what I did when I was waiting for my luggage. Really liked how fast it was. Shuttle service takes about 10-15 minutes usually but that day it took 20 minutes. Driver apologized for being late. Service was very impressive overall. It's great since it's so close to the airport. I don't mind taking the shuttle since it's very fast and clean. I don't like when you park somewhere and take a shuttle and it takes over 10 min. This one was a very short ride in my opinion. The driver is also very nice. This was one of the easiest parking experiences in my life. I just brought my reservation receipt to the office and then I could park my car. I was worried about the shuttle. Haven't had good experiences with those but this one was great. There was a lot less of a wait time compared to other ones that I've used before which I really liked. I was happy with my experience. The people who worked there were very nice and helpful and answered my questions. I was probably holding up the line but they still took the time to help me out. I have a bad back and I liked how the driver was very helpful with my luggage and they even helped me put it on the cart too. The fact that he took some extra time to help me out is why I am writing this review. Excellent customer service and I would use them again for my next trip. Since you reserve online, I didn't have any problems with them not having my receipt or spots being filled up. I didn't have to drive around looking for open parking and I didn't have to pay for a cab either. Needed to find a place that was in my budget for my 10 day trip and I found Orom-JFK Airport Parking online. It was super convenient and easy to use and for a week I only spent $90. I paid online so that when I got to the place everything was already taken care of! This place is a great option if you're traveling out of JFK. It's very close and the shuttle takes a short time and the driver is really good at packing it with people so you aren't waiting very long to get on and off. For the price, we weren't expecting a lot but the shuttle is very nice and clean and the service is very good as well. Shuttle does get packed though. There was a family of 6 that came after us that we let go on the shuttle by themselves so we had to wait a little longer but we didn't mind that. The staff is amazing and are the reason that I keep coming back here. They are very helpful and friendly. The driver even gave us tips of places to check out when we were on vacation which were great recommendations. It's very easy to get to and in a great neighborhood with lots of places around that you can check out if you want to find something to do. The shuttle took about 15 minutes but loading it took no time at all so we didn't mind having to wait a bit longer. I have used this place many times. I haven't always had the best luck when it comes to parking lots so this place was something that I needed. They are a lot cheaper than airport parking and very convenient because of the shuttle service. It took us to our exact terminal and even was waiting for us when we returned from our trip. I used this about a month ago when I went on a vacation and was very happy with my experience. I've never used long-term parking before but it was very convenient for my trip. I just showed them my reciept and then parked my car. Took no time at all. I called the office to ask them a question and was recommended a few places in the area to get food before our flight as well. Everything was beyond what I expected. The staff is excellent. The shuttle was only a 5 min wait when we got there so that was great. Very safe and secure parking. They have video cameras that are all around and also a security guy. I was told that the security guy is there all the time. The office is very helpful and I didn't have to wait long to park either. Had a good and easy time parking there at the beginning of the trip but we waited at least 20 minutes for the shuttle at the end which I thought was a bit of a long time. Didn't realize that we were supposed to call for a pick up until we had already been waiting for 10 minutes. Really think that they should just have shuttles waiting there all the time. I have trouble parking in some places but this one had very spacious spots and also there was no height limit either. It's also affordable which is great for when you travel as much as I do. So so happy with this place! Not only was the parking lot service very good but I also had a really comfortable trip both to and from the airport which is what you want after a long flight. Liked how everything is cash free. You just need a credit card if you didn't already pay online and if you did, then you need to bring your receipt code with you and use that to get in and out. I think it's one of the easiest ways to park. You really can't go wrong since it was under $20 a day. For some people, they might complain about the fact that the shuttle isn't always just waiting to pick people up but I don't mind that at all. I just called the shuttle when I was waiting in line at customs and it was there by the time I had my luggage and went outside. Some of the best service that I've ever had. I always worry about leaving my car overnight but once I saw the lot and talked to the attendant I felt a lot better about it. I came back and my car looked the same as when I left. Excellent! I got there in the morning before my flight and honestly I expected it to be very slow since it was very early but it wasn't. The attendant was very friendly and recommended the best spot for my car since there weren't that many filled spaces. She even called the shuttle for me and told them to pick me up at the spot instead. It was really excellent service and is the reason that I will use this place again. Pretty big so we didn't have to worry about not finding a spot. When we got there there were at least 20 spots left but they filled up by the time we got on the shuttle. The shuttle driver was very nice and professional, helping us with our bags but also being very friendly which made the ride go very fast. It was also really easy since we just had to show our receipt to get in. I go on quite a few trips for work. It seems like at least once a month I am using some kind of parking service like this. I used to just cab it to the airport but that got a lot more expensive than just parking my car at Orom. It's the only parking that I use anymore especially since I've never had a problem with leaving my car there. I'm not usually not gone that long but it does add up the more that you use it. It's located in a good area. Not that industrial so you can always grab a bite to eat or buy some snacks and stuff for the airport. Buying anything at the airport is very expensive and I try to avoid it when I can. We ended up going to the 7 Eleven nearby and getting some stuff before our flight once we finished parking. I'd probably use it again just for that reason. It was close to the airport and had a shuttle which is why I picked Orom Rent-A-Car Airport Parking. The price was just a bonus compared to the convenience of getting dropped off and picked up at the airport. It's got a good location and good service and a good price which is everything that you look for in parking. The driver was very nice and helped us with our bags and took us right to the terminal. It was a short ride. Usually I don't like shuttles because I find them very cramped and uncomfortable but this one was very nice. My husband and I used this recently when we went to Florida for a week. It was very easy to use. As soon as we got there we just showed our receipt for our reservation to the office and then they directed us from there. They were very helpful and answered all my husband's questions. He's very particular about his car and wanted to know everything about the security of the place. Then we parked, grabbed our bags and went to the shuttle. My husband was also very impressed so I'm sure that we're going to use it again. The office was very helpful and nice. We had to call for the shuttle to pick us up but they gave us the number when we got there so it didn't take too long. I think the worst part of traveling is the waiting around and I liked how little waiting there was here. Even the actual ride to the airport, it felt like it was very short. The office is near the front so it's hard to miss. They just need to see your receipt and then they let you through. I didn't have to call for the shuttle since it was already there and the driver waited for me since he saw me parking . I also liked how they actually had real people working it wasn't all automated so that we could ask questions and get help faster. Parking is very easy and fast. I mean there's not much else to say about parking. You pull your car in and park but it was easy to drive on the ground. There were no cracks that would make it rough. I only waited about 10 minutes for the shuttle too and it was very nice and clean which made it a very comfortable ride to the airport. I don't usually write reviews on sites like this but I was so impressed by Orom Airport Parking that I needed to say something about my experience. I was amazed at how EASY it was to use their system. It took less than 3 seconds to scan my ticket and you really can't beat the price. Cost less than $100 for a week parking here. I used to park at this other lot that was $25 per day on weekends and $20 for weekdays but when I found this place and saw the price I couldn't believe it. I got everything that I used to get at that other parking but it was a lot cheaper. This is the only one that I'm going to use from now on. If you need to park your car for a few days I would 100% recommend using JFK Airport Parking. It's the best price which is great if you're planning on leaving for a long time and my car was basically in perfect condition when I got back. No scratches or problems. I checked pretty thoroughly before we left the lot. It's pretty hard to find parking for under $20 a day even with taxes and it's not as close to the airport as I want but still happy with it overall. It was very fast. We had alreay booked online so we didn't have to wait for anything. I appreciate the chance to skip all the waiting to get a ticket or waiting to pay. We just showed our ticket at the office and then we got to park right away. The shuttle was also very fast. We only waited for 10 minutes which was fantastic compared to other shuttles that I've used and the trip to the airport was very comfortable. I have used way more expensive parking lots that didn't have as nice and clean a shuttle as this one.It was also one the quickest way to the airport that I've ever experienced. Good job! Overall it was a good experience. I liked the shuttle although it was a lot smaller than I thought it would be and we had to wait to have enough space for all our bags. The parking is fine. Spots are good size but when I was there they kept trying to force us to park closer together to squeeze in more cars which I wasn't a fan of. I think that I would use it again but that I would probably try to get in earlier. Can't think of anything that I would change. The shuttle service is free and takes between 10-15 minutes and the driver is great with helping you with your luggage. I booked in advance and I just showed my ticket to the office attendant and then you park your car and then wait for the shuttle to come take you to airport. It took no time at all. My wife and I have been using this place for a bit now and we've always had good experiences. They do a good job of explaining what you need to do. The shuttle is very fast and clean which makes for a really comfortable ride which is good for us because my wife gets sick on buses usually. They have a lot of places but depending on the day and time it can get packed which is why we always reserve a spot before our trips. I've used other parking lots that cost me over $20 a day and this one definitely has the best price for around $12 even with the taxes it's still the cheaper option for me. I also really liked the cashless checkout. It's the way of the future and it makes it easier. You can't beat the price but I am taking points off for the fact that you have to pay extra depending on what you want. Still pretty cheap though. We really loved this place and the service that we experienced. The office was very easy to find and everything went by pretty fast. The attendant was very nice and helpful. The lot itself was a good size which meant that we didn't need to wait for a spot to open up either. I am definitely going to book this place again for our next trip.